Can a brand new museum boost ancient Nîmes’s Unesco bid? A new landmark museum tracing the ancient Roman history of Nîmes will be unveiled in the southern French city this weekend. The Musée de la Romanité, which is estimated to attract 160,000 visitors a year, will open on 2 June as the city awaits the results of its 2012 bid for Unesco World Heritage status. In March, experts from the International Council on Monuments and Sites (Icomos) sent Unesco an unfavourable report after their visits to the sites of Nîmes. They advised that the vote on the city’s bid, expected this summer, should be deferred until France carries out “a thorough comparative analysis on the Roman remains to see if there is potential for a refocused nomination”. However, museum and city officials are counting on the €59.5m museum—funded €35.4m by the local government and other public bodies—to boost Nîmes’s credentials. “The city of Nîmes wants to pursue this architectural gesture, emphasising the collections of Roman civilisation in a contemporary framework, to show that [their] breadth and quality deserve Unesco World Heritage status,” says Daniel-Jean Valade, the mayor’s cultural delegate. Manuella Lambert, the museum’s assistant curator, says the project “is destined to emphasise the city’s ancient heritage and participate in the process of obtaining Unesco status”. 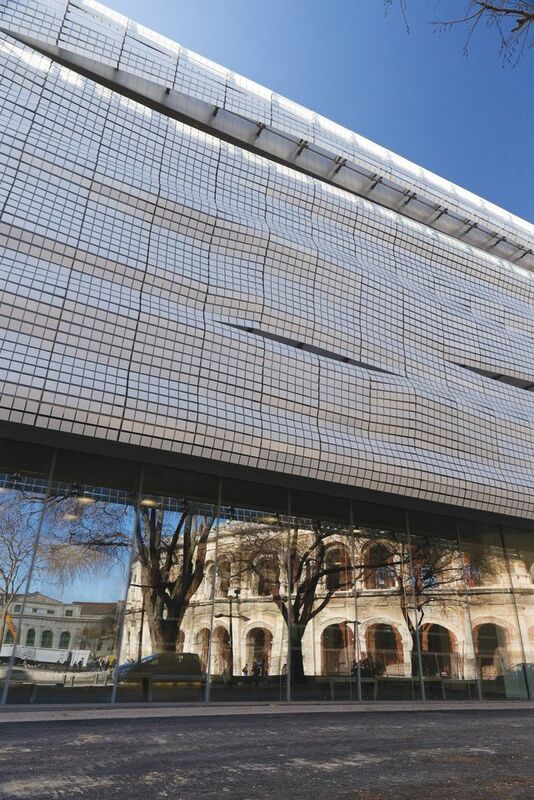 Designed by the Brazilian-born, Paris-based architect Elizabeth de Portzamparc, the Musée de la Romanité is located opposite the city’s 2,000-year-old Roman arena, which is undergoing restoration. The Maison Carrée, a former temple built between the second and fifth centuries, has also been restored nearby. The city’s mayor, Jean-Paul Fournier, conceived the idea for the museum after two mosaics known as Achilles and Pentheus were found during excavations in the city more than a decade ago. Specialists said they were second in beauty only to the mosaics of Pompeii. The third-century Pentheus mosaic is now one of the museum’s highlights, along with a mosaic of the hero Bellerophon riding the winged horse Pegasus, and the reconstituted pediment of the Sanctuaire de la Fontaine, which dates from the imperial Roman cult. The 9,200 sq. m museum will show around 5,000 artefacts from 700BC to the Middle Ages, drawn from a 25,000-strong collection. The works were previously housed in the city’s archaeological museum, which is closing in June. The first temporary exhibition in the new space, the Italian touring production Gladiators: Heroes of the Colosseum (2 June-24 September), is a nod to the fights once held in Nîmes’s arena.